This is the story that I came up with. You can find this and other stories/novels/novellas for free (for now!!) on my wattpad profile @CelticRose. It's rushed, and unedited! I know there are a few typing errors and some mistakes. But I have no time to correct it really, as the deadline is May 29th and I'm going to be really busy next week and the week after! So hoping the judges will be lenient! is not mine, but from The Tale of Genji. For the competition I had to not only incorporate it into the story, but also make it the story's main theme. I took the "locust" part literally, and came up with a Romeo and Juliet tale. Can you spot how/where I slotted them in? I hope you enjoy it! Please let me know what you think. You can also click on the title below and it will take you through to the anthology on wattpad, if you would prefer to read and comment on the wattpad story and read the other two I have in the collection so far. You can read snippets of them in my previous blog post. she of the silent slaying. “What are you writing, Reifujin Zetsumei?” Fumiko asked, leaning over the self-named Lady Death’s shoulder. It was late evening, and while others were practising various disguises and arts in the cool of the garden, Lady Death was working on her calligraphy. Penmanship – or, in this case, penwomanship – was important for the girls raised from the dust. That was what Fumiko called them all, although in Lady Death’s case it was not strictly true. Not that anyone really discussed their past. Not here. In Fumiko’s case, although no one would suppose it now, this was a most apt description – she had been brought to the airy house of paper screens from the dust of the streets where the earth was her bed. Now, with her cobalt kimono and perfect obi, bare feet clean and skin lightly scented, she could pass for a daimyo’s wife. Her bright eyes were dark and demure, warm against the stark whiteness of her face. The Lady was drawn to look up into them, her own brown eyes widening a fraction at being disturbed. “I am writing poetry,” she said. Her voice was quiet and cold. Fumiko was impressed. “You are getting better. I don’t believe even Aiko can write tanka like that.” Her silk sleeve slid over Zetsumei’s shoulder as she read. “Thank you,” Reifujin Zetsumei said politely, curving her red lips into a bow. Fumiko moved away, her own duties to perform. Lady Death was pleased. She looked out at the women training on the grass, their limbs flowing like ribbons through the air. Rising, she went not to join them, but to take up her katana. The story went that when Goku Kyonen felt his end was near, he called for his monk disciples. Once they had gathered he sat up, gave the floor a single tap with his stick, and spoke to them that very jisei. After the last line, he tapped the floor with it again, cried, “See! See!”, and thus, sitting upright, he died. Her reflection appeared in the metal, a finely sliced slither of white and red in the polished surface of the blade. This was her retribution, and it had already avenged her. “I will write my story in blood and more than blood,” the Lady told the steel, and watched as the edge seemed to absorb the mist of her breath. Her reflected cherry lips reminded her of another age, another life, before she had been reborn. All the teaching she had received since then could be found, not at the tip of a holy man’s stick, but at the tip of this very katana. She thought of Kazuhiro, and for a moment, his memory lived on. Then, it clouded, and another took its place. The katana sang as it danced with her, each move re-enacted. She had become strong under the careful instruction of Mochizuki Chiyome and Takeda Shingen’s instructors, one of the first recruits. She had proved herself, and was now something of a veteran. There were many others now, raised up from wherever Chiyome hime found them, among them young Fumiko who was far too forward and had no manners. She may look the part, but her acting needed work. Lady Death paused, the katana poised delicately, threatening the heart of a single quivering dust mote with its glinting edge. She saw again the snow upon the mountain, and felt the ice under the soles of her bare feet. Creeping forwards, she could almost hear the soft crunching underfoot as her heels and toes sunk into icy pits. She did not shiver. She had steeled her mind against the cold. Disguised as a man, with her hair and garb indicating that she was samurai, she approached the shinobi Takeo. Lady Death was not so beautiful or fragile a woman that this disguise was laughable. In fact, she wore it well. He had recognised her voice – that, she left deliberately undisguised. He turned. His katana was already in his grip, and he was adjusting his stance. His eyes were wary, always darting about just as she remembered. He was always looking for the best strategy, the best tactics. Spinning, Lady Death brought her blade down. How well she remembered! How well she recalled the day, the position of the sun in the sky, the feel of the snow upon her skin and the compacted flakes beneath her feet... Yes. Takeo had been a good strategist. Yet he had known nothing of her plans. The first kiss of steel on steel had jarred her, and the following moves proceeded in the form of some strange dance. Yet all the while, it was as if she were beside some other mountain stream, and the snows became autumnal slopes, and the branches of the surrounding trees were not so glacial and weighed down with their white burdens. She had fought her father’s shinobi with cold calculated precision, but she was thinking of her first encounter with this man, a few years before. The katana eviscerated her imagined opponent, reproducing the fatal cut for Takeo. In her mind’s eye she saw the two figures battling on the mountain slopes in the snow. He had been a worthy opponent. is the blue garment falling. There had been a time when Lady Death had another life, and another name. She had been a daimyo’s daughter, once, a long time ago, and they had called her Sakura. This too was a name, a mere word, that she had learned to shake off. She was no longer a cherry blossom, for the fruit had ripened, and been devoured, and had left only a hard stone behind. There had been a day when she had been in love. Not with another of her rank, but with a merchant’s son, wealthy and a little on the plump side, but good natured and kind hearted, a simple man with a ready smile and a modest voice. The ghost of Kazuhiro, who had never quite shaken off his adolescent nickname Imago, locust, had looked back at her from the snow. fells the locust in the grass. ... And the ghost of Sakura felled Takeo, the approaching silver death now cutting into her father’s mercenary with brutal precision. The battle was done, and Sakura herself was laid to rest with the prostrate Takeo, her phantom at peace as the crimson pool grew and spread. Lady Death had avenged the man she had loved, and the girl she had been. Now, it was the katana that was laid to rest. Lady Death slid it back into the scabbard, its theatrics over for the evening. It soothed her to dance those steps again, and relive over and over the moment when Takeo, the murderer, had himself been slain. Lady Death bowed to the memory of her dead opponent, and returned to her poetry. It was time that the tales of the past were told. Risking death, Kazuhiro shed his childish nickname along with his clothes and, risking death, crept naked save for a loose cloth mask into the daimyo’s garden. His sturdy frame was clumsy and somewhat inexperienced, but, keeping low, he slithered through the grass. 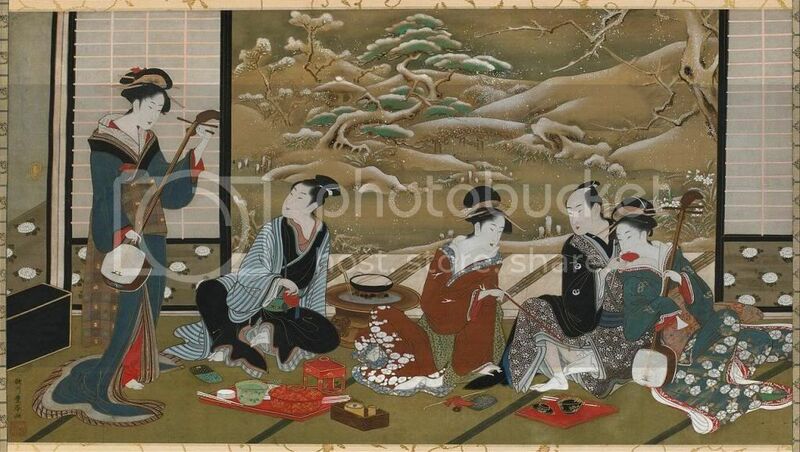 The night cloaked his tentative approach, but the daimyo’s guards were blissfully unaware. Kazuhiro’s cousin had seen to that, with a potent powder dissolved in the saki. The screen slid noiselessly across, lubricated by the amorous merchant’s overeager bladder, and he slipped into the apartments of the daimyo’s daughter. The practice was an ancient one, and he meant his beloved no harm. Her reaction was unlikely to be ambiguous, and if he had read her glances correctly, he would soon have his answer as to her opinions of him. Kazuhiro paused to steady himself as the floor creaked a little under his careful foot. His heart thudded in his chest, filling his burning ears with its hard hammering. What if she did not like what she saw? Would she scream? Would she cry out? He was not the fastest of runners, and he feared that his cousin’s concoction had not been strong enough. Should the guards wake, he knew he would be caught. A second screen had to be negotiated, and as nervous as he was, he was out of natural lubricant. It did not need any. The screen behind which his cherry blossom lay rustled gently as it slid open, as if whispering a blessing on his approach. The bold night crawler crept forwards, a poem from Ono no Komachi on his lips. He intended to wake her with classical words of love, to show his intentions were pure and to show off his learning a little. It would not come amiss, he thought, and he wanted her to wake with the beauty of the lines chiming in her ears. Up until now, it had felt as if that were true. It was bold of him, and he knew that she must surely scream. He was so far beneath her, so very far, that he was nothing but a worm to her glorious kite. Yet when she stirred, and he stammered out his lines, hardly daring to raise his eyes to gauge her reaction, there was no scream. She hissed, a sharp intake of breath, upon realising there was a naked man standing above her. His face was covered, but when she recognised his faltering voice, he held no fear or horror for her. It was the first time that they had spoken directly. He opened his mouth, and closed it again. Suddenly, he was a naked man before a beautiful girl, and more vulnerable than she. There was a bright light in her eyes, and he thought there was hope in that at least. But she was waiting. And he was naked, and had nothing to say. The silence between them deepened, pregnant with tension, and became painfully awkward. Suddenly, in the throes of chest-tightening anxiety, Kazuhiro forced himself to take a breath and stare, not rigidly fixed upon the question in her eyes now clouding with a little scorn, but at her essence. He saw her again, as if with second sight, and revelled afresh in the revelation of her beauty. There was only one thing he could say. “Katsu!” he murmured, his enlightenment attained in that moment. Surely the blissful state of nirvana could be no greater than this. Thus the enlightened Kazuhiro, called Imago ‘the locust’, scented the cherry was ripe. Softly the lover caressed the smooth skin, succulent with the promise of pleasure. He caressed the curves beneath him with a light, savouring touch, his excitement a gauzy fluttering dancing within him like a thousand wings. The cherry yielded to the locust, surrendering its sweet flesh to his worshipping appetite. As if caught on the gust of a playful breeze, bending and swaying upon its stalk, the cherry broke its tether and tumbled discreetly into oblivion. fruit picked clean to the pit. “Where will we go?” Sakura whispered. Her eyes were reflective pools of orchid-scented beauty, aflame with the excitement of her recent daring. War or no war, the daimyo had insisted that the Tsukimi festival went ahead as planned. Out in the gardens, in the deep plum of the autumnal night, the golden lanterns were glowing. Decorations of pampas grass and offerings of chestnuts were made in honour of the moon’s beauty, and the Tsukimi dango left their tantalising savoury aroma on the air. A black lacquered bowl of these plump celestial delights were set near her father, and behind the gathering of feasting Firsts stretched a floral frieze and a wintry scene of bowing tree and reaching blossom. Sakura had slipped away from the festivities and the poetry reading, away from the scene beyond the screen doors where her father the daimyo sat listening to the music. Sakura could not play as well as Aiko, but she was not jealous. She appreciated the talents of others without jealousy, a quality her Fourth rank merchant had fallen in love with. Although his name was Kazuhiro, everyone called him Imago, meaning locust, because as a child he had devoured everything in his path. There was still some trace of this vast adolescent appetite in his waist and cheeks, but Sakura had still hid her coy giggles behind her fan whenever he caught her eye. He was charming, and so quick to make her laugh that she had been captivated from the moment they met. His parents were the wealthiest of their order, but still the Fourth, and not the First. Yet Sakura’s heart had been captured, irrevocably, a fluttering thing as fragile as a locust’s wings. Sakura knew that their love was impossible and shameful. Kazuhiro was of the lowest Order, and there could be no hope for them. She hoped that her father would be distracted by the tense situation unfolding. She had overheard him in a rage – that did not bode well. There would be a clash, another war, more battles, more sieges, more deaths. None of that mattered in the arms of her locust, safe and warm against the ravages of the night. Not even the threat of assassins scared her when she could see Kazuhiro smile. They would run away together on the night of the moon festival, and they would live far away from all of the terrors of this life. Perhaps they would find a place where the prayer wheels turned, a place silken with harmony and the chanting of monks. No matter where they found themselves, Sakura was sure that their love would make the very earth sacred. Running away was the starting point. She even hoped that the fresh delivery of weapons from China would distract the daimyo to the extent that he would not notice she was gone until it was too late. Sakura convinced her Imago, her locust, to flee with her. Under cover of darkness, the cherry blossom wrapped herself in silks and flew into the night with her beloved Kazuhiro. Poor Sakura; so simple, so sheltered, and so naive. 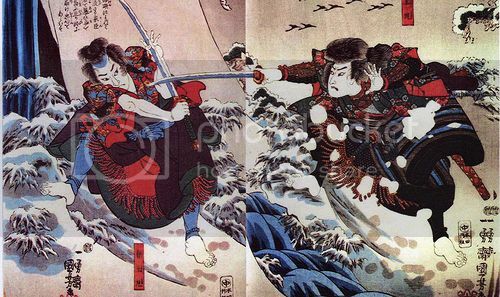 War or no war, distractions or no distractions, the daimyo would not part with his daughter so easily – not for all the matchlocks in China. Poor Kazuhiro; not fast enough, not strong enough, and not clever enough. 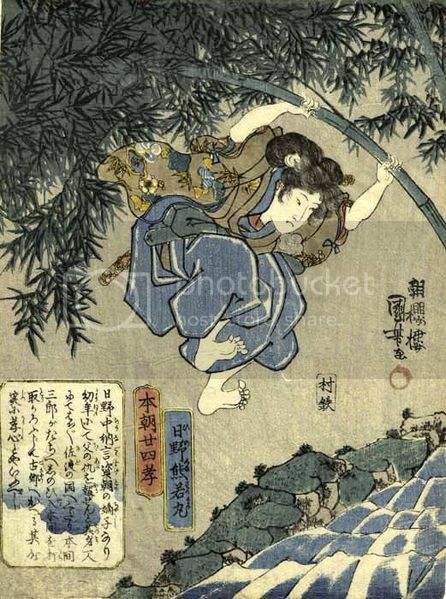 He did not see Takeo in the trees above the water, he did not hear the shinobi drop until the feet swung out and down, catching him in the chest. Poor Takeo – he had no way of knowing that soon little Sakura would find herself a benefactress in the form of Mochizuki Chiyome, that her education would be so comprehensive, and that they would meet again one winter when the snows had covered the slopes. Lady Death returned to her poetry, determined to complete her work. She drew her inspiration from Sakura’s memories, from the remnants of the girl she had been, hidden away in the funerary urn of her heart. She could not go on. Reifujin Zetsumei rose, defeated by the past. She, the slayer of Rokkaku Atsushi, she, the bringer of silent death, was rendered powerless by the phantasm of dying love. Lost in the years of war and honour, lost in the years of teaching and instruction, lost like the dew upon a locust’s wing, were the tears of the vanished Sakura.